Hello friends, as I type I am lounging on a comfy couch with my couchsurfing host, Alex. 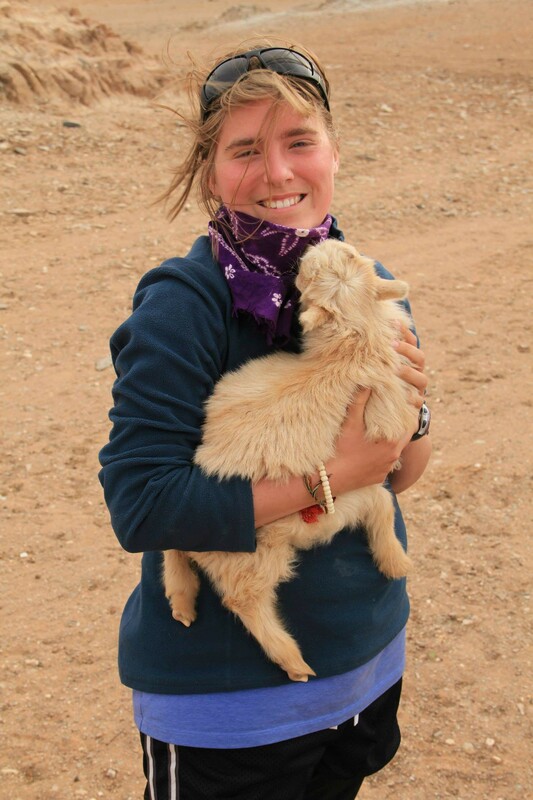 Alex is a post peace corps volunteer and now she works at the American University of Mongolia as an English teacher. I will stay in her studio apartment until early next week, where then I will meet with my college buddy, Heath, and we will travel together! I am very lucky to have Heath as a contact. He is the reason I am staying with Alex in the first place. Hooray for friendship! 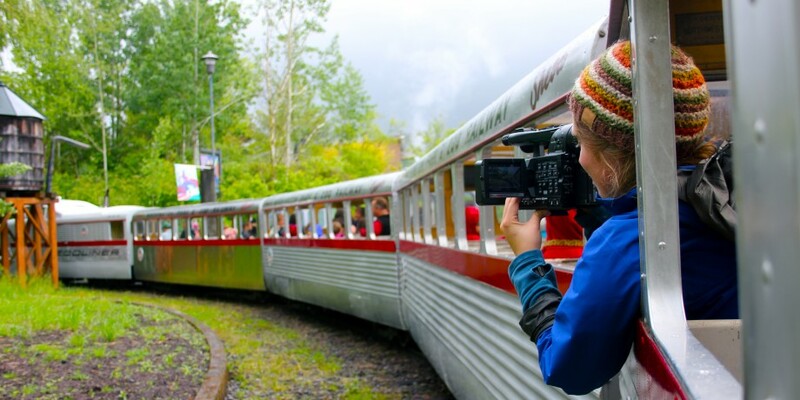 I also wanted to say that my Russian visa application went through and I will be taking the Trans-Siberian Railway in July! I am so excited! I can’t believe I’ll finally take the train. I’ve been telling people for the last year, “yeah, I’ll be traveling through Asia for a few months. I really hope to take the train to Moscow though.” And now I am. Huzzah! 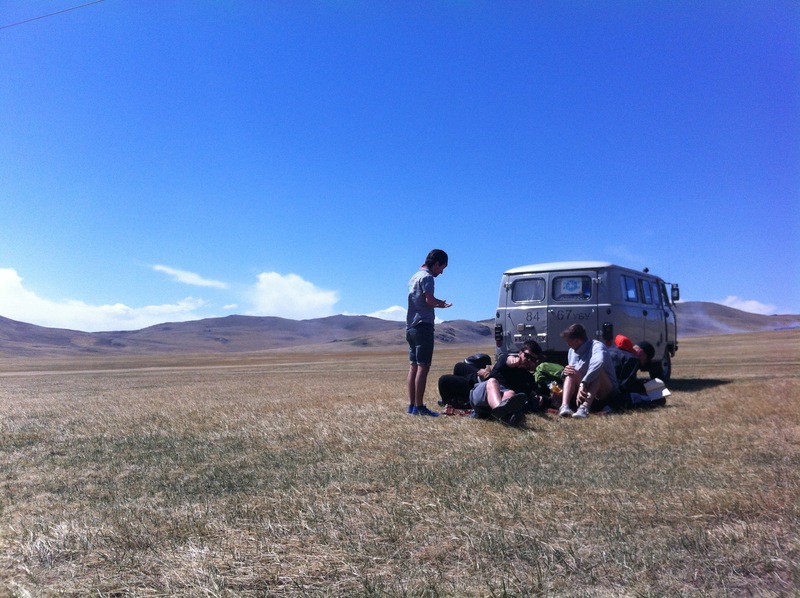 Well, let’s finish up my Gobi trip. Mike, Otto, and Ganaan chillin’ during a lunch break. So, we left the quaint town of Arvaikheer and headed NW towards Mongolia’s tallest waterfall in the Khuistin Naiman Nuur National Reserve. It was a very long car ride, but the most scenic. 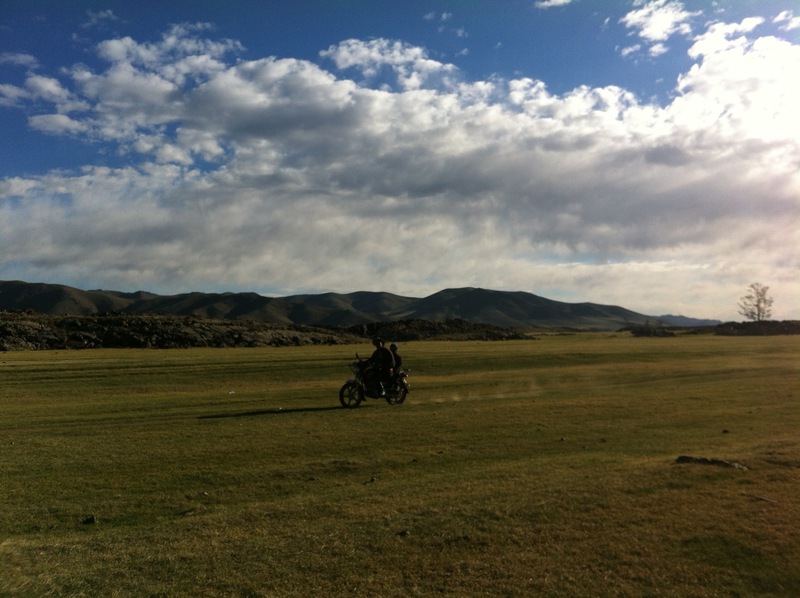 In the Gobi, the landscape was beautiful in an empty way. There was the occasional pack of camels in the distance or a herder with his sheep, but there were not many trees or greenery. Well, on that last long drive, we went from desert to mountainous valleys and forests. The scenery was stunning and luckily the weather was perfect. We made a stop for lunch and were surrounded by mountains. We climbed a nearby hill while Khulaan was cooking. The wind was so strong that it could hold me up if I leaned over a little. The boys went back down pretty quickly, but I stayed up a bit longer. There is something special about a strong wind, at least for me. It reminds me of the time when I was a kid and I would lean against the wind near my house. Or the times when my sister and I would take our dads big umbrella and try and fly away with it during a storm. There were so many horses in this park. Wow. We continued on our way and finally reached the nature reserve. We drove through the reserve for a couple hours and stopped a couple times to use nature’s toilet and to watch the horses pass by. 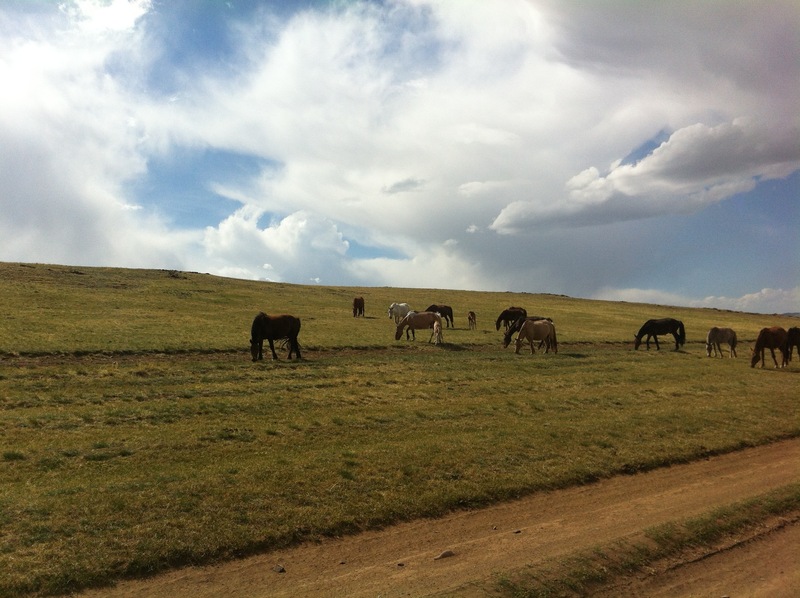 There were so many horses. 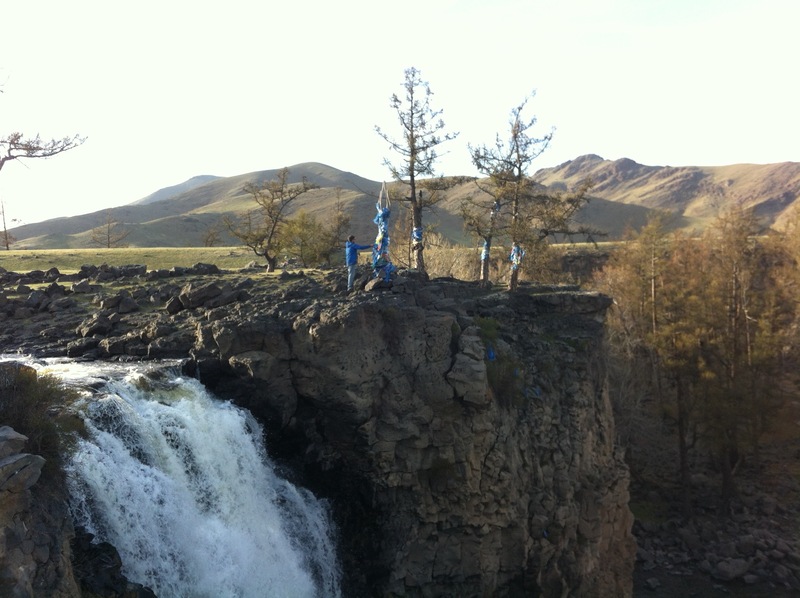 We made it to the ger camp before sunset and were able to visit the famous waterfall. It was only a 10-15 minute walk away from the ger camp. And man was that waterfall gorgeous. The evening sunlight made the whole place look magical. The wind had died down by then, so I sat down beside the top of the falls, listening to the water rush by. I looked around me and could see there were mountains surrounding us, that there are hundreds of yaks/cows grazing nearby, and that the sun was setting to the west. What a beautiful place. I spent the rest of the evening teaching frisbee and playing soccer with the local children. The top of the falls. The next morning, I woke up nice and early and decided to go on a hike. Breakfast wasn’t until 8:30am, so I had 2 hours to explore. I could see a small mountain to the south and headed towards it. The landscape was how I described it in an earlier post: BIG. The fields are so vast that while walking through them, they remind you how small you really are. I made it to the top of the mountain with time to spare. I found a nice flat rock and sat, watching the sun rise above the mountains to the East. Before my descent, I watched the locals begin their daily lives. I could see men letting their cows graze, I saw men take their horses out to the fields, and I also saw some children playing near their ger homes. They were only black dots in the distance, but I was happy to be apart of their morning. The lone motorbike. Probably heading back to their ger. After breakfast, Khulaan showed us the way to the bottom of the waterfall. 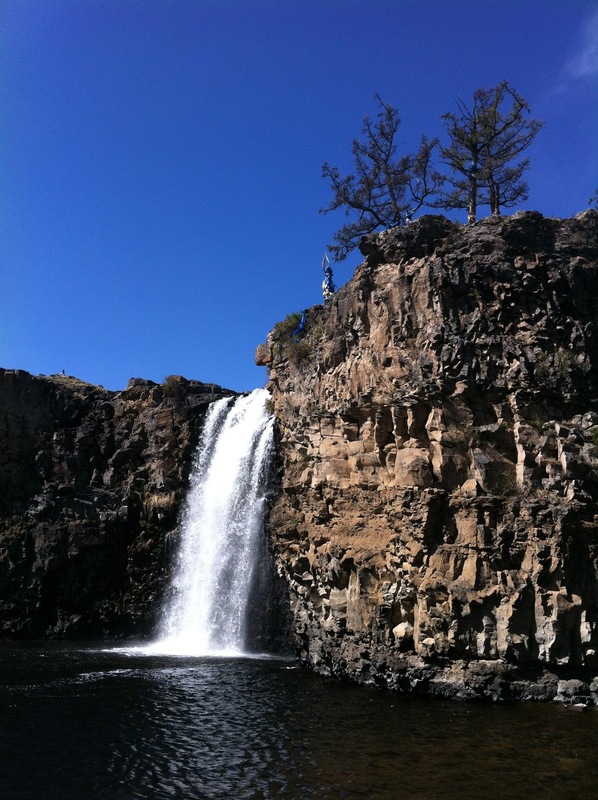 The boys were foolish enough to jump into the frigid water. I enjoyed my time on the rocks, napping. I was pretty sleepy after my long hike that morning. After some time, we packed up and headed back to our ger. I noticed a trail on the way back and told the boys that I’d meet them later in the afternoon. I continued walking on the trail and it led me to a grassy meadow. The meadow was surrounded by moving water (one side was the river and the other was a small stream). There was a perfect spot to sit right where the rivers converged and I did just that. I sat and did some meditation. After, since the weather was perfect, I decided to nap some more below the shade of a birch tree. Another highlight was that evening. The boys and I went outside to brush our teeth and as we were brushing away, we looked up to the sky. The stars were the best I had ever seen in my life. The sky was clear and the moon was a thin crescent. I knew I couldn’t pass up this moment, so I decided to sleep outside that night. Mike joined me for a short while, but he got too cold. I woke up a couple times. Once by the local dog nuzzling beside me, wanting to steal my warmth. The second time was because the temperature dropped significantly. I looked up to the sky each time I awoke and was stunned by the amount of stars. I even saw a few shooting stars. Before I went back inside, the Milky Way was right above me. I had never seen it so clearly. I’ll keep that memory, for sure. 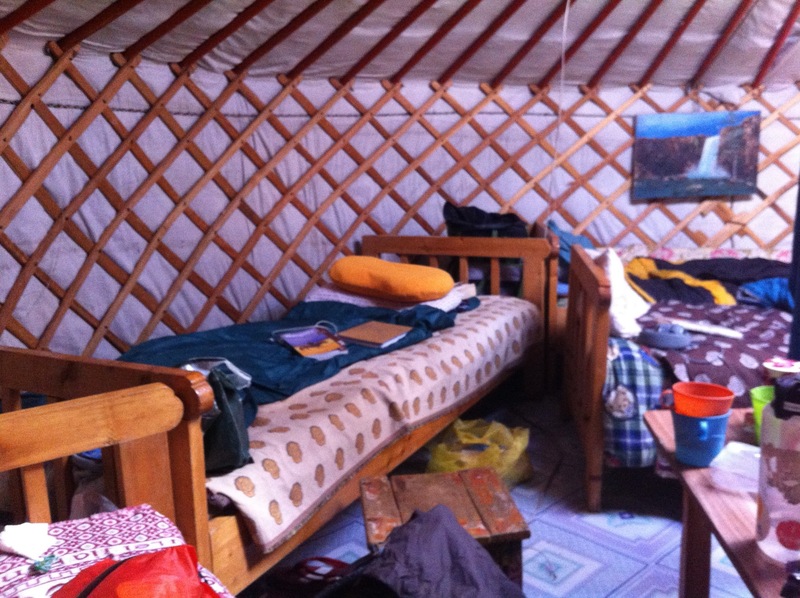 We left the following day to our last stop: Kharkhorin town. 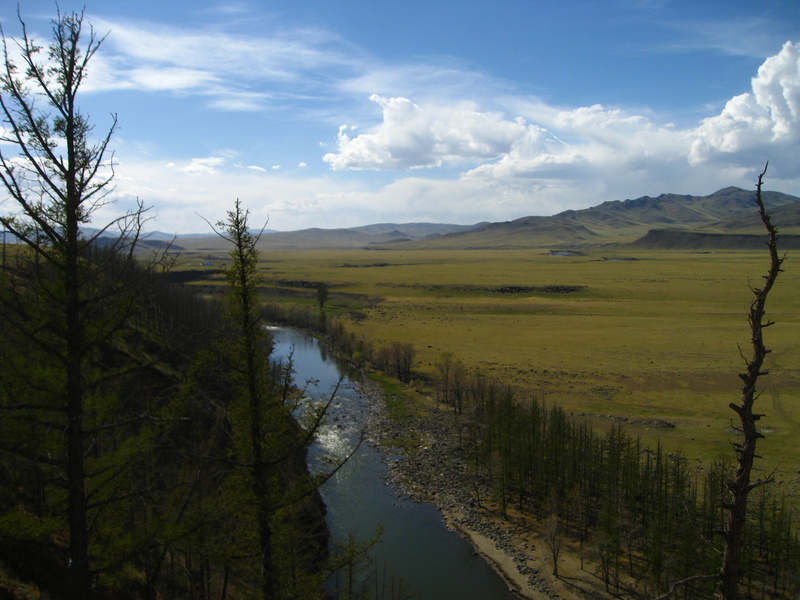 This town is famous for having the first Buddhist monastery in Mongolia. 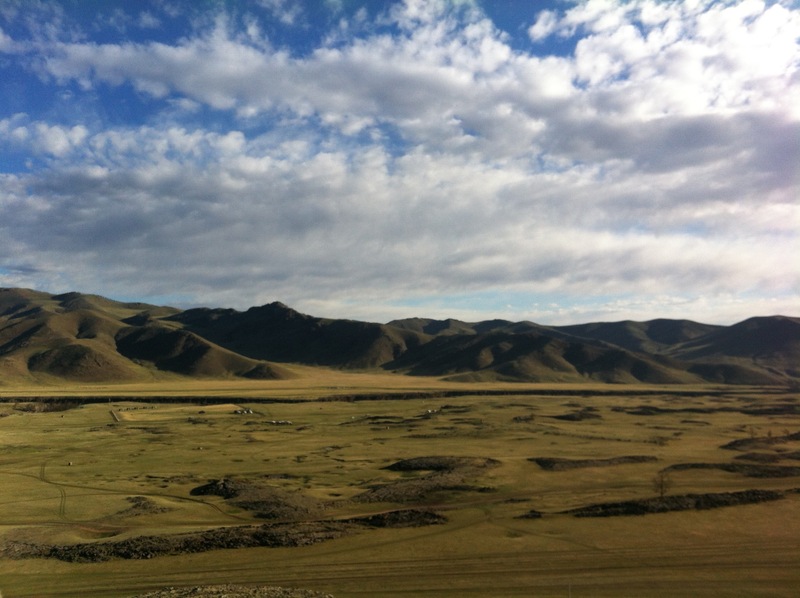 The monastery is called Erdene Zuu Khiid (Khiid means monastery). We were fortunate enough to visit and to walk the grounds. I learned that it was founded in 1586 and once had 60-100 temples and 300 gers. Sadly, Stalin came in and nearly destroyed all of them. Only after the collapse of communism in 1990, was the monastery reopened for worship. Gosh, Mongolia has gone through a lot of strife. 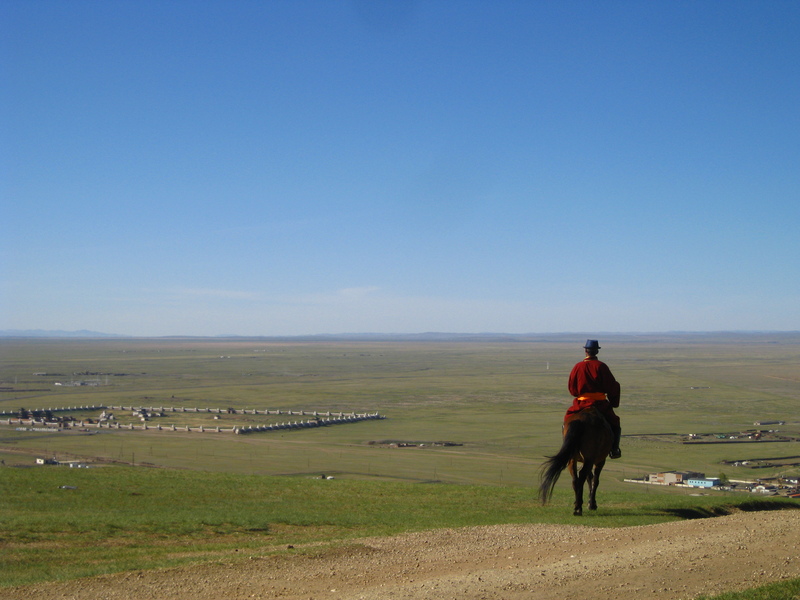 Erdene Zuu Khiid to the left and a herder to the right. There were also 4 stone turtles that represented the boundaries of the once ancient Karakorum. Only 2 have survived and I visited one. It was on top of a hill to the south of the monastery, and near the ger camp we were staying in. 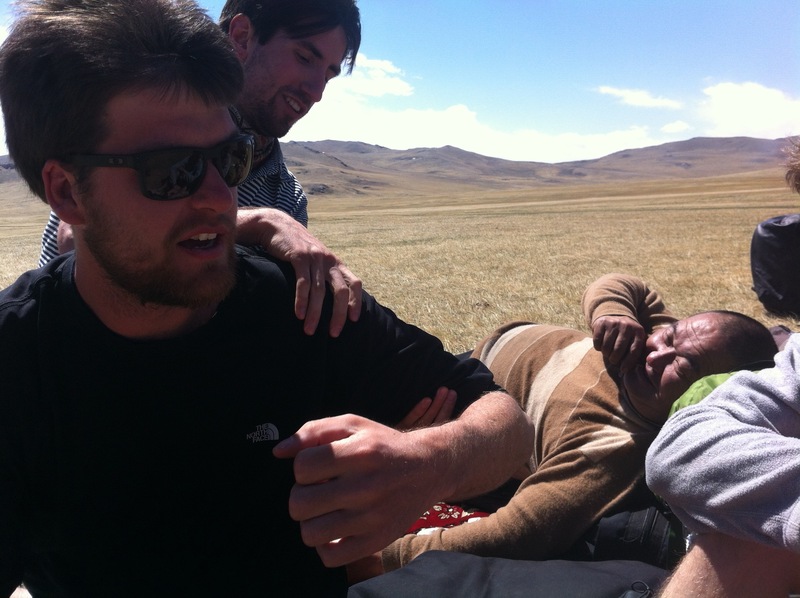 I met a few herders up there, they were bringing their goats back home after a long day. There was a moment, when I was sitting beside the turtle rock, where I was completely surrounded by goats. It was a very funny experience. The men on horseback also found it hilarious. We laughed together and then we all went on our merry way. I spent the evening reminiscing with the boys about our trip. I had a very nice time with them. I’ll keep Sweden and Canada close to my heart. So, I guess I’ll talk about my backpacking trip in my next post. I’ll write it later because I’m meeting a buddy at the food market this afternoon. I’ll miss spending time in the gers with good company. Thanks again boys! Enjoying your blog, a vicarious break from computer monotony. It’s such a cool trip you’re taking. When I’m off the work treadmill I’d love to do a round the world trip.